I wish Scott Barry Kaufman had been my college professor. Scott told me that he gives extra credit for daydreaming in his classes. That would have been an easy A for a space-case like me. Scott is the scientific director of The Imagination Institute in the Positive Psychology Center at the University of Pennsylvania. The Imagination Institute’s mission is to “make progress on the measurement, growth, and improvement of imagination across all sectors of society.” One of the ways it’s doing this is by conducting retreats with different groups of people — such as educators, evolutionary psychologists, standup comedians, and futurists — to learn how they use their imaginations in their work. 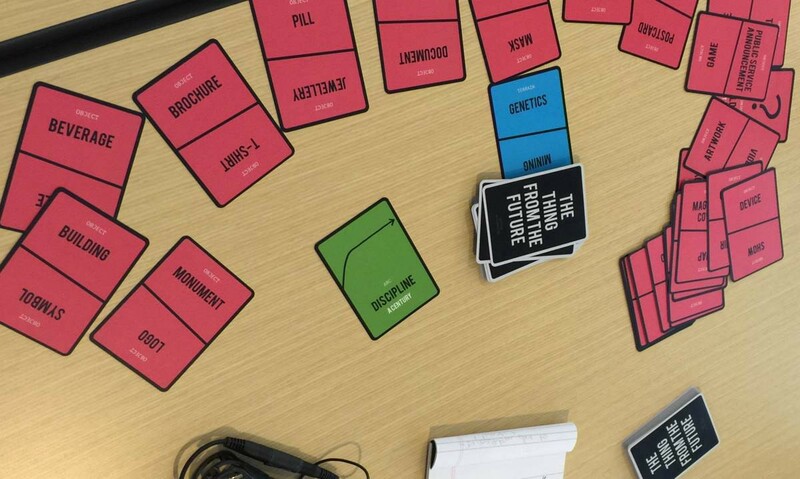 In May 2016, I participated in The Imagination Institute’s two day “futurists retreat,” held at Institute for the Future’s Palo Alto headquarters, where I’m a research director. I arrived on Tuesday and met the other participants. 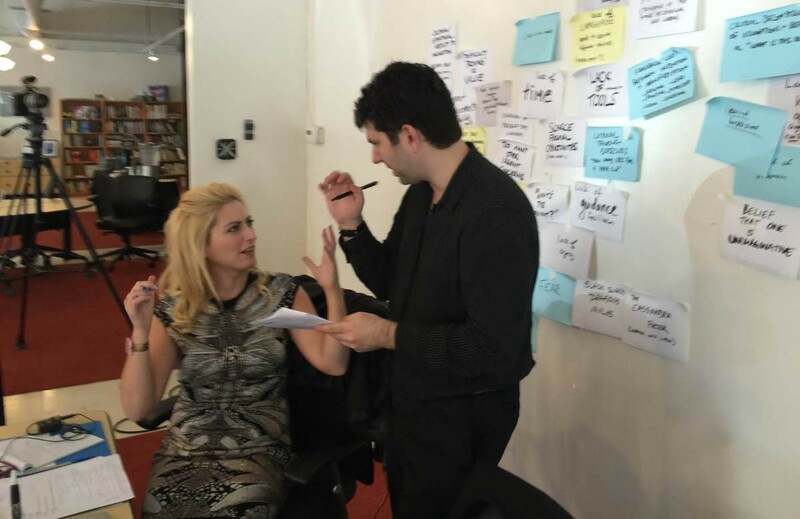 Leading the retreat along with Scott was Jane McGonigal, IFTF’s director of game research and development. Jane’s a game designer and author of two New York Times best-selling books about self-development though imagination, creativity, and play. We were joined by IFTF staffers Tessa Finlev, Dylan Hendricks, Sarah Smith, and Kathi Vian, along with futurists Stuart Candy and Jamais Cascio, Imagination Institute’s Elizabeth Hyde, and James W. Hovey of the Eisenhower Fellowships. What follows is my account of the retreat, and the five memorable insights I gleaned from the experience. In the morning Jane led a group exercise to introduce The Imagination Institute to the idea of futures thinking. Everyone was given a pad of giant sticky notes and asked to write down the reasons why some people can’t (or don’t want to) imagine the future. Doubt. Belief that there’s no value in imagining the future. Urgency. Many people are too poor, hungry, or victimized to have time to imagine the future. They must attend to urgent present needs. Apathy. Some people don’t care about the future. Interestingly, almost everyone wrote down the same first idea (putting people in cages), and it was usually the first item on their list. 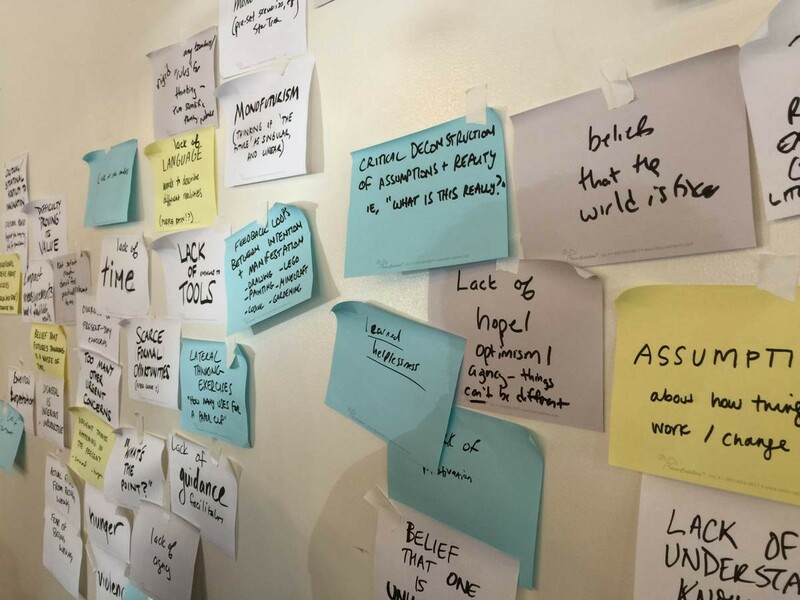 Jamais Cascio, a distinguished fellow at IFTF said this is common in forecasting exercises, and described it as “emptying the bucket of the obvious.” Once you do that, you can draw from a deeper source. Logic. Does it make sense? Does it create an aha! insight? Complex (or Nuanced). Does it take many factors into account, avoiding a simplistic model of the world? Evocative. Does it cause an emotional response? Provocative. Does it upset, excite, and cause discomfort? Stimulating. Does it include implications? The three example maps show how a forecast might be mapped. Forecast A is strong in every aspect, but suffers from being overly simplistic. 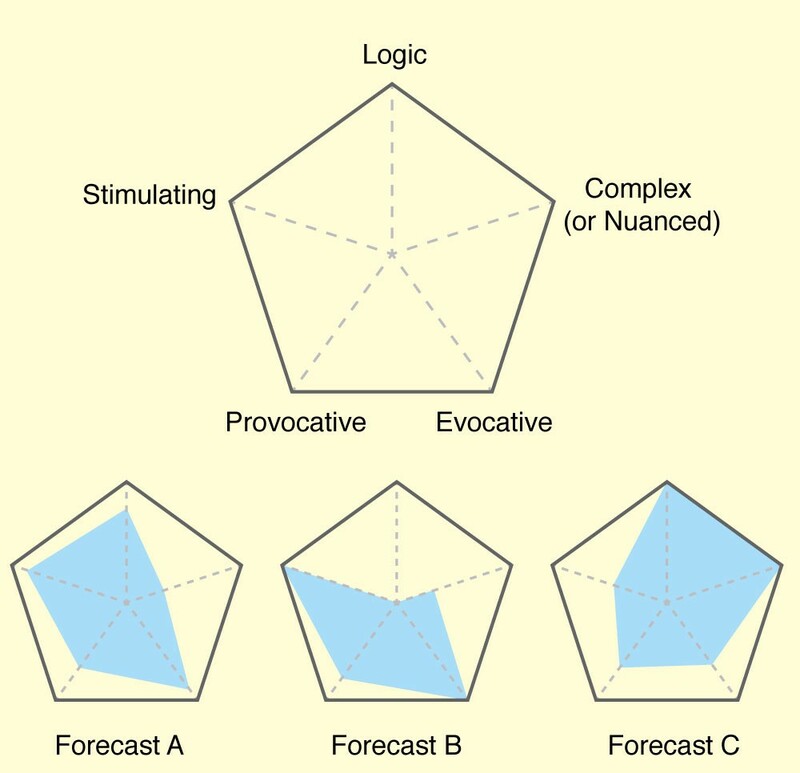 Forecast B is emotionally powerful, but lacks logic and complexity. Forecast C is complex and logical, but perhaps not as stimulating as it could be. This forecast quality map is a rough prototype, of course, and we discussed ways it could be refined, but I feel that something along these lines could be developed into a something useful. Near the end of the day, we talked about imagination as a tool that we can use to create the future. For example, health organizations in the 1970s imagined changing the way people thought of cigarette smoking, which was considered at the time to simply be part of adulthood. The organizations succeeded. Today, smoking is considered disgusting and dangerous. Such a profound transformation in attitude is evidence that people can combine imagination with action to make a better future. Learn how you can imagine futures at IFTF.org. Research director at Institute for the Future. Co-founder, Boing Boing, editor-in-chief of Cool Tools.